Corporate affiliate programs are designed to provide members an exclusive view into the research and activities of specific departments or programs within a university and foster dynamic collaborations between the university and the affiliate program members. They also allow university researchers to better understand, appreciate and meet the needs of industry. 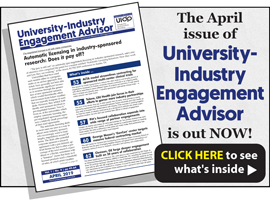 The benefits to each party can be profound, from new revenue, new partnerships, and licensing opportunities for the university to talent acquisition, a ready source of valuable innovations, and a competitive advantage for corporate affiliates. In short, these programs have proven to be an outstanding funnel for long-term value and growth in industry engagement. That’s why Technology Transfer Tactics’ Distance Learning Division is teaming up with Todd Cleland, PhD, Senior Director of Corporate Relations for the University of Washington, to discuss how to structure, manage and grow various types of corporate affiliate programs. Please join us on May 16, 2019 for this business-building webinar: Cultivate Winning University-Industry Relationships Through Corporate Affiliate Programs. For complete details and to register, CLICK HERE.